Home > Air Travel > Does the Type of Aircraft Matter? 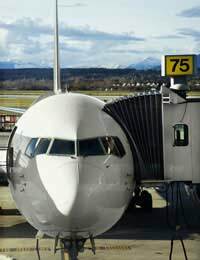 Flying has been on the receiving end of a great deal of criticism of late, with long-haul flights in particular suffering a distinctly bad press. Although air travel is not currently the largest carbon contributor, if flying continues to grow as rapidly as predicted, this is almost certain to change in the future, which places great importance on anything which can be done to reduce the overall impact of aviation. While much of the thrust of this will inevitably involve taxation and regulation at a Governmental level and carbon offsetting and ethical tourism at a personal one, there is scope to consider not only how far and how often you fly, but also in what type of aircraft. When it comes to environmental impact, not all planes are the same. The amount of carbon released by an aircraft is directly related to the amount of fuel they use, a little over three grams of CO2 being produced for every one gram of kerosene. Since figures for the amount burnt per hour are readily available from the manufacturers, it would seem a simple exercise to spot the best and worst models. However, as with so many issues of the whole carbon/climate debate, rating their performance is not as straightforward as it first appears. To make a fair comparison, the energy required per person must be taken into account. A Boeing 747, for example, releases around 35kg of carbon dioxide per kilometre, while the now moth-balled Concorde used to emit only 22kg, making it the “first-sight” winner. Factor in the Jumbo’s 450 seats to the supersonic airliner’s 100 and it becomes clear that the 747’s emissions are three times lower per passenger – assuming the plane is full, of course. Although long-haul flights are often heavily criticised, in terms of fuel use – and emission levels – per passenger, small turboprops and jets on short regional hops are often more thirsty, as they are frequently under-occupied and the highest fuel use occurs in take-off and landing. One of the times that the performance differences between aircrafts really begin to matter is when it comes to making the calculations necessary for accurate carbon offsetting. The fuel consumption of an individual aircraft is normally expressed in nautical miles per kg of fuel when cruising, but this is not a constant figure as it varies with speed, the weight of the plane and the altitude at which it is flying. Historically each plane type had long range performance charts which gave optimum fuel efficiency, but today the job of optimising fuel consumption is done by on-board flight management computers, so comparisons of this kind are no longer just so readily made. Fortunately, it is possible to get a good general indication of the emissions generated simply from the distance flown, the type of aircraft and its published fuel usage figures. However, to be absolutely accurate it is necessary to take into account other factors, including the number of passengers, total plane weight, wind speeds and direction, aircraft and engine type, cruising altitude and speed, exact flying time, length of taxiing and any landing delays. Such detailed data is seldom readily available; though the more that can be factored into the calculation, the more complete the result – and the more clear the influence of the individual aircraft type. If the new Airbus is taken up by the number of airlines that many predict, then the question as to whether the type of aircraft matters will be answered with a resounding “yes!” The A380 – a double-decked monster of the skies, carrying over 500 passengers at a time – promises a 20 – 30 per cent saving per passenger over equivalent aircrafts by using high-efficiency engines and lighter alloys. Where one manufacturer goes, others will surely follow and with KLM estimating that around 80 per cent of the CO2 emissions from air travel is produced on trips longer than 1,500km, the advent of this kind of high fuel economy in the long-haul arena has got to be good news. In the end, the whole performance issue revolves around the particular circumstances of each flight and a constant trade-off between cruising speed, altitude, passenger numbers and aircraft weight – and if it all seems horribly complicated, that is probably because it is!